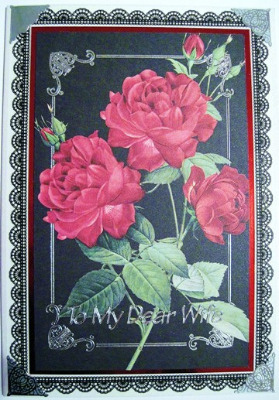 Ivory pearlised handmade card 127 x 178 cm (5" x 7") has picture of three red roses on a black background, matted onto red mirror card, surrounded by delicate black paper lace edging. The corners are embellished with silver coloured celtic heart corners, which match the silver detail on the picture. 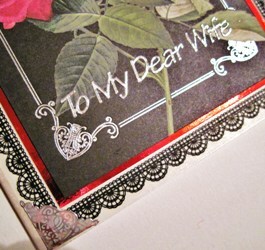 The words "To My Dear Wife'' are embossed in silver. Please use the Personalise form if you would like different wording on the front. Choose a printed paper insert from the options (recommended) or leave blank if you prefer. This design is also suitable as a birthday or anniversary card.